LOUISVILLE, Ky. (AP) — Louisville finally got to play a home game on Monday night, and the No. 5 Cardinals took full advantage of the opportunity. Miami: A veteran-laden team with four starters returning from a 21-win team that reached the WNIT, the RedHawks found themselves down by as many 18 points late in the first quarter and never recovered. The Cardinals’ quickness gave the RedHawks fits throughout the night as Louisville got 16 steals and scored 20 points off Miami turnovers. Sophomore Dana Evans scored 14 points for the Cardinals. It marked her third consecutive double-digit scoring performance, but what’s impressed Walz more about his guard so far this season has been her ball-handling ability. The 5-6 five-star recruit has 33 assists to just 13 turnovers, including an 18-to-4 ratio in the last three games. Walz said his team will still get the Diop’s leadership, albeit from the bench. However, they’ll need to make up for her rebounding and defensive abilities. 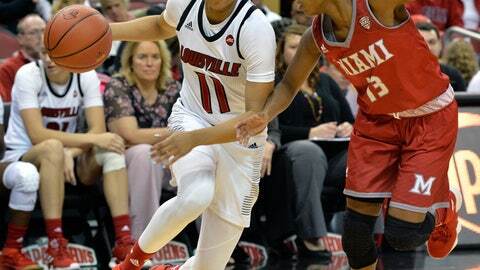 She averaged 6.3 points and 4.3 rebounds in four games with two starts for the Cardinals. “She led us in deflections, was one of the tops in steals,” Walz said. “So, we’re going to need a little bit more productivity from all” the remaining players.